​This painting is about wet sand squishing between little toes, dancing waves, gentle breezes and pink clouds in the sky. It's sand crabs disappearing under the sand and leaving tiny bubble trails, seashells washing up at our feet, the smell of salt air, and children enjoying a walk on the beach together. Most of all it's about being fully aware in a beautiful moment. I love the colors and the peacefulness of this painting. Memories was inspired by one of hundreds of photographs I took for a portrait of the two girls in the painting. They summer each year in the Bethany Beach area with their parents. 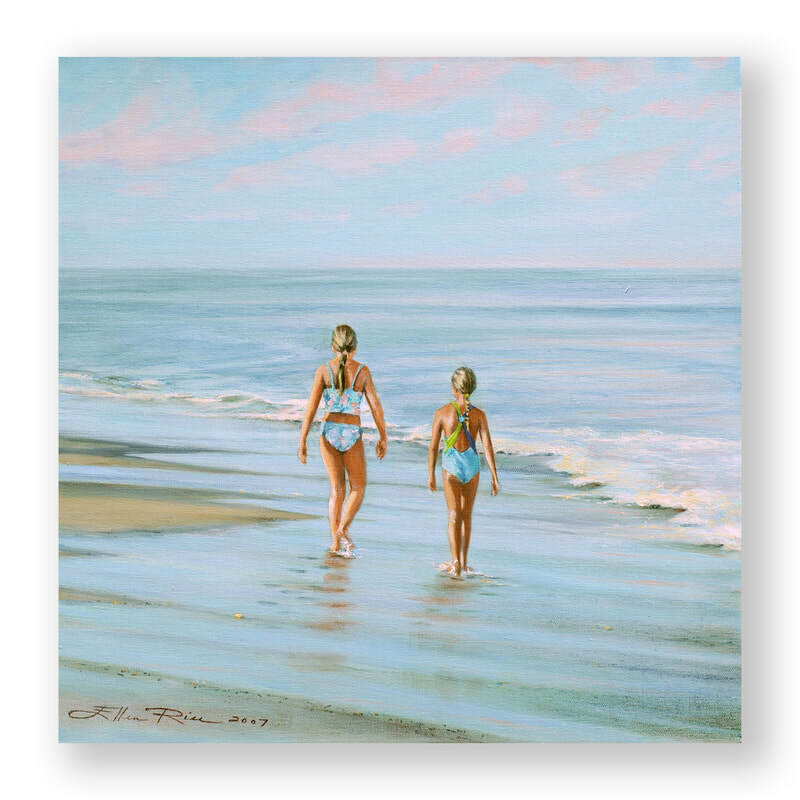 From the moment I watched the girls walking down the beach, I felt impelled to paint them that way. Happily, their mother gave me permission. There's a sense of timelessness about this painting. It's a moment. Pristine. Beautiful. It won't pass this way again, but will always be held dear in memory. Mine. The girls. The parents. Anyone who appreciates the beauty of the beach and two wet little swimmers taking a walk together along the shore. It makes me wonder where their paths will take them. For now, still in their childhood, there's a game they like to play. On special evenings, when the conditions are just right and the sun begins to lower, ribbons of pink light the sky and flicker across the ocean. The girls and their mother love to "follow the pink" reflected in the water. As the sky changes, the pink seems to go ahead of them and they keep following it until it disappears with the sunset. In Memories, our young swimmers, fresh out of the water, have just started playing their favorite evening pastime, following the pink. What a lovely way to spend the close of a beautiful day at the beach. I may give it a try. Enjoy!